Now this book and CD are a delight - essential to those who play the folk fiddle, I would think, but a honey jar of wonders for those like me who are fascinated by the well known English and Celtic tunes that have migrated and transmogrified, the tunes that have been written over the waters, but also very much by those tunes that the Americas have preserved but we have lost. One wonders at the history of "Doney Gal" (61) - presumably a corruption of "Donegal" ? The tunes start with such well known ones as "Flop-Eared Mule" (1) and "Turkey in the Straw" (3), and include other well known ones such as "Cluck Old Hen" (73) an "Jack o' Diamonds" (76) but there are others that I have loved for some time scattered through the collection : "Beaumont Rag" (91) (I first heard this from Neti Vaan, on one of her visits to Kent from New Orleans), "Glory in the Meeting House" (83) (familiar from the playing of Ben Paley), Blackberry Blossom (32) (a tune Saskia Tomkins is partial to) as well as "Midnight on the Water" (94), and the tune here titled Raleigh and Spencer (97). 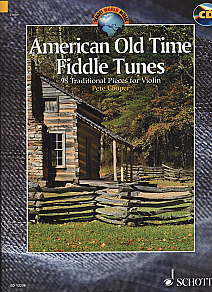 The 80 page booklet (in English, French and German) gives the tunes in stave notation, with extensive notes on regional and other playing styles : "Kentucky fiddlers play differently again, in a fluid, pulsing style, often with 'jumps' ahead of the beat, to bring out the intrinsic syncopation of the tune." The tunes are split into sections, depending on the tuning - some such as Cotton Eyed Joe (6, 21, 67) appear in more than one tuning. Each section is preceded by an open string playing to aid setting the fiddle tuning. The playing of the tunes is as clear and authoritative as one would expect from such a fine player as Pete Cooper, who has a long history of teaching fiddle. The bowing ornamentation and syncopation specific to particular tunes are added as needed. Pete Cooper plays, teaches, composes, records and writes about fiddle music. He is best known for his tutorial books and his folk collections published as part of the Schott World Music series. His unusual fluency in different styles - English, Irish, Scottish, Old Time, Swedish, Eastern European - has been described as 'chameleon-like'. Eastern European Fiddle Tunes, Irish Fiddle Solos, English Fiddle Tunes.